People pose for a picture among wildflowers in bloom Monday in Lake Elsinore, Calif.
As the barren California desert sprang to life, they descended. With their selfie sticks, their smartphones and their gee-whiz-look-at-all-the-flowers smiles, they seemed blissfully unconcerned that they were causing something close to a panic at the highest levels of local government. Roads backed up for miles. Parking spaces were gone. Wait times for the city's shuttle service were measured in hours. To help cope with the surge of traffic, the city of Lake Elsinore brought in all available staff, asked county agencies for help, reached out to the California Highway Patrol. On Facebook, the city pleaded with visitors to stay away: "Our City is not made for Disneyland size crowds." The cause of all this consternation? Poppies. Specifically, a super bloom, often seen after a particularly wet winter. Super blooms happen about once a decade in the region, but this bloom was different. "This is something unlike anything we have ever experienced in our City and may never again," the city wrote. The super bloom of 2019 goes by many names. Mayor Steve Manos has alternatively dubbed it "Poppypalooza" and the "poppy apocalypse." By Saturday night, Manos had estimated 50,000 visitors had come to the city, population 60,000, about a 90-minute drive from either Los Angeles or San Diego. 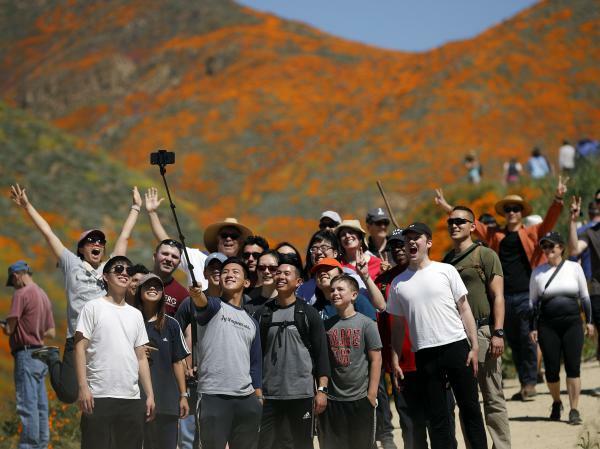 Most tourists gathered in Walker Canyon, which offered the most glorious sights of poppies on rolling hillsides. By the end of the weekend, Lake Elsinore had been tromped through by as many as 150,000 people. "Interstate 15 was a parking lot," The Associated Press wrote. "People fainted in the heat; a dog romping through the fields was bitten by a rattlesnake." Conditions sometimes made for perilous poppy posing. "Wildflower-seekers slid and fell down the side of Walker Canyon that was never meant to be hiked on, though some managed to do so anyways — even in very chic wedge heels," according to the Palm Springs Desert Sun. "Families and Instagram-influencer wannabes alike attempted feats of free-climbing and scrambling as large boulders toppled down behind them as every step kicked more rocks loose, threatening to squish children or seniors who couldn't lunge out of the way fast enough." The city said that all available staff mobilized. Council members waved flags to direct traffic. One city employee was hit by a car, Manos said in a video. "The guy that got hit by the car got up, limped off and worked a 12-hour day." By Sunday night, the city had made a decision, and it came with its own hashtag: #PoppyShutdown. "The situation has escalated beyond our available resources," the office of City Hall wrote, explaining that no additional shuttles or visitors would be allowed into Walker Canyon. "This weekend has been unbearable." But when they tried to close the roads, people found a way. They pulled off onto the shoulder. They parked on the freeways. Anything to get to the poppies. "We don't have the resources to keep it closed," Manos said. "It's an entire mountain. Please be patient." By Monday, the roads were open again. The great #PoppyShutdown had ended as quickly as it began. With more rain expected for this week, that can only mean one thing, Manos said: The poppies will continue to bloom. And the people, with their selfie sticks, will continue to come. "Hang in there!" he said. It has been spectacular in Lake Elsinore in California this season, and the town has been mobbed because of that beauty. The culprit is an abundance of orange and yellow poppies. They blanket the landscape as far as the eye can see. KELLY: It is being called a super bloom brought on by rain. People have been coming by the thousands to bask in the bounty. STEVE MANOS: The flowers have covered the entire mountain. And they're very vibrant this year, plentiful in ways that you just don't normally see. CHANG: Elsinore Mayor Steve Manos says in his 32 years in town, he's never seen anything that compares to this year both in terms of flowering plants and number of visitors. Police estimate 100,000 people came to check out the super bloom on Sunday. KELLY: Which has meant the fragile poppies are being crushed. People are lying down in the fields to get that perfect photo for social media. So Mayor Manos has issued a warning. MANOS: Keep your dogs on leashes. Don't pick the poppies. Don't trample the poppies. Don't wade into the poppies. Don't roll around on the poppies. Don't slide down the poppies. CHANG: He might add this. Do avoid rattlesnakes. One of them bit a man. Another bit a dog. KELLY: Casey Schreiner - he's the founder of modernhiker.com - has been paying attention to the super bloom in Elsinore this season. Schreiner has a theory about why it's been so crazy. CASEY SCHREINER: The first thing that's causing this increase in traffic is the word super bloom itself. You know, we used to just call it spring. CHANG: To limit the damage, Schreiner has a hashtag he hopes will encourage people to respect the flowers. SCHREINER: We want people to use this when you are taking a photo of wildflowers and you didn't go off trail to get the image. You left the flowers in the habitat as you found them. You didn't damage any other trails or, like, use user trails or make your own stuff to get the image, and you're sharing the philosophy of native plants in your post, too. CHANG: So take a visit and take a look and take those pictures. But please try not to destroy the very beauty you came to see. (SOUNDBITE OF GOLDFRAPP'S SONG "BLACK CHERRY") Transcript provided by NPR, Copyright NPR.